The grand, rugged Kyrgyz Republic is an adventurer's dream! Over eighty per cent mountainous, it boasts some of the highest altitudes and the second largest mountain lake in the world. On one border lies China and the eastern realms of the Silk Road On the other sides it is surrounded by its sister countries of Kazakhstan, Uzbekistan and Tajikistan. 80 different nationalities live here and rest assured that you will never find a warmer welcome; be it in a yurt in the valleys or in a home in the capital of Bishkek. The natural beauty of Kyrgyzstan draws travelers of all kinds. Untouched by development the country's glittering peaks and glaciers, pristine forests, clear mountain streams and lakes and glorious green valleys beckon you to paradise. The Pamir-Alay range in the southwest and the Tien Shan mountain range in the northeast, dominate the terrain. Here, the summer weather is superb for trekking and rafting and in the winter for heli-skiing. The swift-flowing Naryn and Chui rivers boast up to Class VI waters! The endangered snow leopard makes its home here and Kyrgystan is active in protecting its habitat in these two mountain ranges These mountains also harbor over 2000 lakes and natural hot springs. The largest of these is Lake Issyk-Kul. Known as the "pearl of the Tien Shan", its aquamarine waters lie at an altitude of 1500 meters and at 180 km long, the opportunities for water sports are unparalleled. Luxuriant pastures and orchards dot the green valleys where seasonal herding is still practiced by the families who live there. Sheep and horses were traditional currency; used to buy goods, a weapon, or a wife! The number of horses owned determined a family's status and played an integral part in the life of the traditional nomadic people. Kyrgyz cuisine includes lamb, cheese, yogurt and kumiss (fermented mare's milk). Horseback riding is a popular pastime and travelers are regaled with performances of traditional horsemanship skills and games. Sheep were once a measure of a man's wealth. Now you'll see felt and wool handicrafts; carpets (shyrdaks), hats (cholpakss) and ala-kiyis – small wool carpets or wall hangings in the bazaars of the cities of Kyrgystan. The capital Bishkek is said to be one of the greenest cities in Central Asia. Bishkek sits in the center of the Chu valley at the foot of the snow-white Ala-Too Mountains. It's a bustling city that's a shopper's delight with bazaars offering everything from exotic food and fruits, colorful clothes, porcelain, wood carvings, pillows and goods from China. It was originally a caravan rest stop. Today, it is a vibrant, culturally diverse, rapidly modernizing city filled with parks, galleries and fountains. Amongst the treasures of Kyrgystan are thousands of historical and cultural monuments to explore; primitive cave-dwellings and rock petroglyphs and as well as the remains of ancient settlements and medieval fortresses. 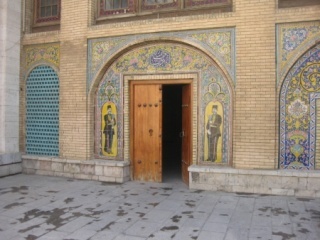 Legend has it that the three-thousand-year-old city of Osh was founded by King Solomon himself! Dominated by Suleiman Mountain, Osh lies in the southern part of Pamir-Alay and includes the hilly lowlands of the Ferghana plains. 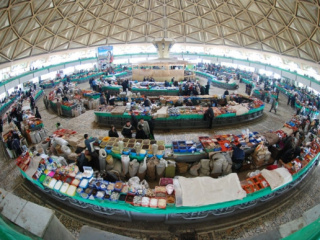 The Osh bazaar has occupied the same site on the banks of the Akbura River for 2000 years, having been at the crossroads of several branches of caravan routes that made up the Silk Road. Come and explore all of Kyrgystan, where a treasury of history and wealth of natural beauty awaits you!